2013 W Form is not the form you're looking for?Search for another form here. Being self-employed in the U.S. has its drawbacks and benefits. On one hand, you’re able to choose your own working schedule and take back control over your free time. Still, this doesn’t mean you don’t have any obligations. Reporting your earnings and submitting all the necessary tax documents is now your sole responsibility. That’s why it’s important to keep your paperwork organized while being aware of the tax rules and deadlines imposed by the IRS. How to fill out Your W-9 Online? Enter w9.pdffiller.com in your web browser’s address bar. Click the orange Fill Online button to proceed or click the form preview on the right side of your screen. Go through the instructions section if you have any questions. 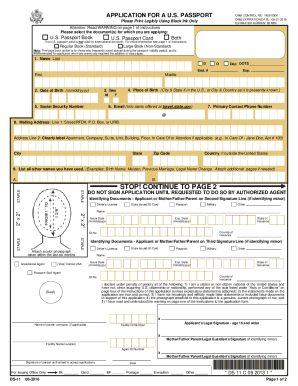 Start filling out your form line by line. Carefully check the data you’ve entered. Fill in the date field and sign your document using the Signature Wizard. Choose what you want to do next with your W-9, i.e. send it via Email, Fax, SMS, USPS, print it out or share it with a direct link in one click. The W-9 is a single-page IRS tax document also known as the Request for Taxpayer Identification Number and Certification. Along with other information returns required by the IRS, Form W-9 is one of the most frequently used tax reporting documents in the United States. Although the form itself doesn’t have to be sent to the IRS, it contains important information which regulates the relationship between employers and employees. Let’s take a closer look at Form W-9 and find out more about its peculiarities. What is the Purpose of Form W-9? Typically, a W-9 is used when a company or business receive services from a freelance contractor. That’s why every employer in the U.S. has to provide a Form W-9 to each self-employed worker i.e. independent contractor, LLC contractor, vendor, freelancer or invited consultant they hire. The contractor, in return, has to fill out and submit the W-9 and send it back to the employer who is obliged to keep the form for several years. Technically speaking, the W-9 serves as confirmation that a newly hired contractor is responsible for paying his or her own income tax and for covering Medicare and Social Security. 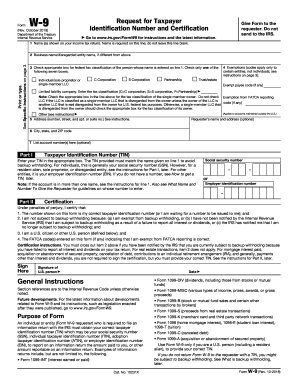 As mentioned above, the form doesn’t have to be sent to the Internal Revenue Service. Instead, it is sent to your employer or the human resources department of the company you work for. The information provided on the W-9 is used by employers to fill out another tax document known as the Form 1099. Subsequently, it enables the IRS to match independent contractors’ earnings with their annual income tax using the W-9. The form contains all the necessary details about a self-employed person, i.e. his or her name, business name (if applicable), address, social security number (or employer identification number) followed by a signature and the date the document was completed. By signing the completed Form W-9 you certify that all the identifying information provided on the form is correct and that you’re exempt from backup withholding. W-9’s are usually updated once a year. However, in some cases, an unscheduled form review may also take place at the behest of the employer. For instance, your W-9 may be reviewed when your contact information (i.e. name, business name, address) or tax ID number changes and has to be updated. Find more information about completing a W-9 on WikiHow. Who Needs to Fill Out a W-9? If you provide professional services to more than one company or business, you may have to fill out several forms. It’s also important to check your status with the company or employer you’re working for and make sure you’re classified as a freelancer, not a full-time employee. Otherwise, the company may unexpectedly send you a W-4 instead of a W-9. When am I exempt from Filling Out a W-9? Freelance workers should be aware of cases when filling out a W-9 is not a good idea. For instance, you might receive a W-9 from an unexpected source and it’s important to know what to do in this situation. First of all, you have to ensure that an individual or business asking you to complete a W-9 has an appropriate reason for this. It’s a well-known fact that some monetary institutions (i.e. banks) use the W-9 each time they want to report dividends at the end of the year. The problem here is that, most likely, the financial institution already knows your tax ID number which means that completing and submitting Form W-9 in your case is totally useless. In most cases, a business or financial institution provides you with a blank Form W-9 that you need to fill out before cooperation is established. The blank W-9 is available for download at the IRS website. 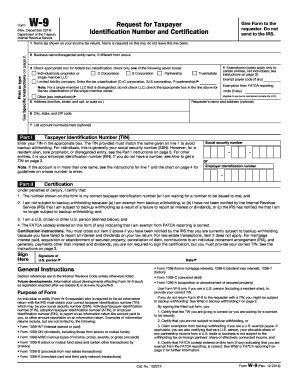 Finally, there’s a convenient and simple way to fill out a fillable Form W-9 sample online via PDFfiller. ... Information Returns (Forms 1097, 1098, 1099, 3921, 3922, 5498, and W-2G) ... Occupational Tax and Registration Return for Wagering, 1213, 11/15/2013.